BOOTIE LA – Geek Night! 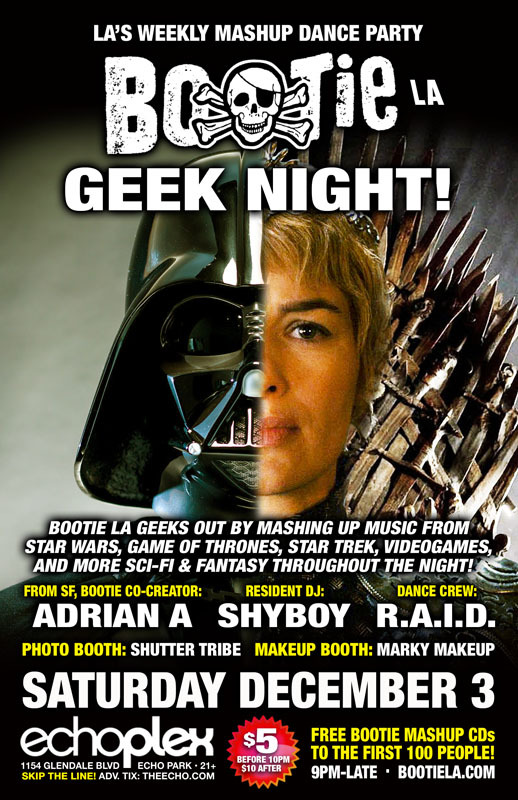 Los Angeles BOOTIE LA – Geek Night! Bootie LA geeks out by mashing up music from Star Wars, Game of Thrones, Star Trek, videogames, and more sci-fi and fantasy throughout the night! Only $5 before 10 PM! Mashing up music from Star Wars, Game of Thrones, Star Trek, videogames and more! It’s a night to celebrate the inner nerd in all of us, as Bootie LA throws down Geek Night! Resident geeks Adrian A and ShyBoy mix and mash the best music from Star Wars, Game of Thrones, Star Trek, videogames, sci-fi and fantasy, and more, all night long! Dress as your favorite geeky character or mashup a few, and get ready to get down on the dance floor! Resident dance crew R.A.I.D. (Random Acts of Irreverent Dance) fills the stage with epic go-go insanity, while Marky Makeup gives your faces and bodies a touch of geek, and Shutter Tribe captures all the fun! All this, plus FREE Bootie mashup CDs for the first 100 people through the door!